Shellfish like lobster and prawns really do go well with the delicate flavour of chicken. For slow-cooked chicken dishes it’s better to use thighs rather than breast meat as they stay more moist and succulent. Remove the meat from the lobster tails and claws and cut roughly into 1cm pieces. Reserve one lobster head (if making a large pie). Break the rest of the shells up a bit, using a heavy knife. Cut the chicken thighs in half, or into thirds if large. Cover and refrigerate the lobster and chicken meat. To make the sauce, heat the oil in a heavy saucepan and fry the lobster shells, garlic and shallots over a medium heat for 5 minutes until they begin to colour lightly. Add the butter and, once melted, stir in the flour. Add the saffron, tarragon and tomato purée, then gradually stir in the white wine and the hot fish and chicken stocks. Strain the sauce through a colander into a clean pan, moving the shells with a spoon to ensure all the sauce goes through. Tip about one-tenth of the shells into a blender and add about a cupful of the strained sauce. Blend until smooth, then strain through a fine-meshed sieve into the sauce in the pan. Bring the sauce back to the boil, add the chicken and simmer for 5 minutes. The sauce should be a thick coating consistency by now; if not, simmer a little longer (or dilute a little cornflour in water and stir into the sauce). Leave to cool. Stir the lobster and chopped parsley and tarragon into the cooled sauce. Adjust the seasoning if necessary. Fill a large pie dish or 4 individual ones with the mixture. Roll out the pastry on a lightly floured surface to a 5mm thickness. Trim to about 2cm larger all round than the pie dish (or cut discs large enough to cover individual dishes). Brush the edges of the pastry with a little of the beaten egg. Lay the pastry over the filling, pressing the egg-washed sides on to the rim of the dish(es). 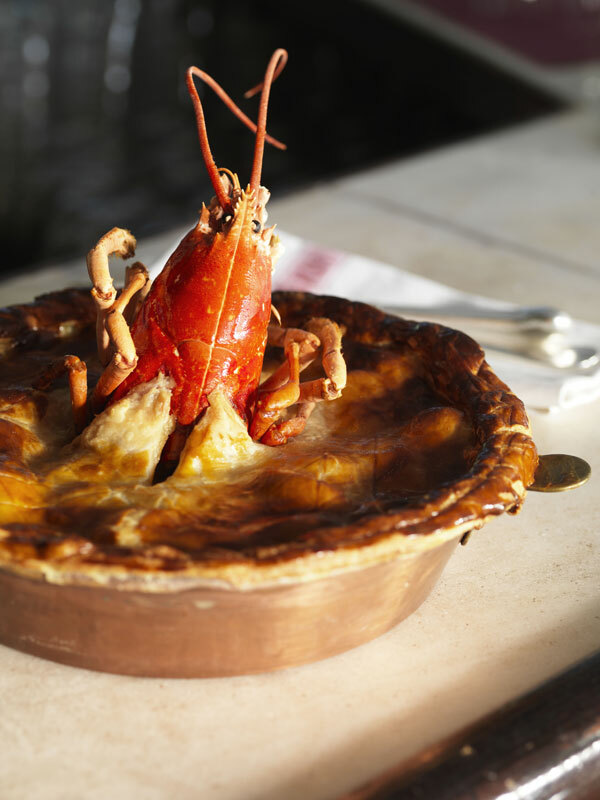 If making a large pie, cut a cross in the centre and insert the lobster head, so it sits proud. Cut a small slit in the top of individual pies to allow steam to escape. Leave to rest in a cool place for 30 minutes. Preheat the oven to 200°C. Brush the pastry lid with beaten egg and bake the pie for 40-50 minutes or until golden brown (allow 10-15 minutes less for individual pies). Let the pie stand for a few minutes before serving. This entry was posted on August 5, 2011 at 1:11 pm and is filed under Food with tags butter, chicken, chicken stock, chopped garlic clove, cornflour, double cream, egg, fish stock, free-range, freshly ground black pepper, lobster, parsley, pie, plain flour, prawns, puff pastry, recipe, saffron, salt, shallots, shellfish, tarragon, thighs, tomato purée, vegetable oil, white wine. You can follow any responses to this entry through the RSS 2.0 feed. You can leave a response, or trackback from your own site.